YES! 686 would be awesome! I love a full framed revolver. I have a 6" Colt Official Police in .38 spcl. It was manufactured in 1947 but shoots like a dream. Oh, its also black (blued). Well, this just arrived, and honestly, one of the best quality .30 cans i've ever seen, really over the top. I played with a shield and didn't like it, too thin that's why I went with a 9C its wider and has a 12 round clip. Do not get a LCP 380 they are cute and pack a punch for the one shot you get before they jump backwards. The only firearm I have ever owned (since I have been an adult) that I got rid of. I have to ask, Madmaxx. How much was that m855 per round, and where did you get it? I'm always looking for a better deal. Also, nice keyboard. I have one of those, too. The Shield worked for my Sister for some reason, she tried a few at the range and that's the one, c'est la vie. That was on a deal Black Friday week, after shipping, worked out at around 27c a round. I splashed out on the keyboard a few years ago, after realising i had only had 3 keyboards in over 15 years, and one of them i didn't pay for! It's a good deal, nice to type on. The IMI stuff is usually pretty decent. I think I've seen those 420rd cans, cant recall price though. $.27 is really good! Usually I cant find 5.56 for $.35-40 a round. Still better than most $.50/rd store bought stuff. I finger banged a shield and wasn't too fond of it either. I ended up picking up an XDS in .45 for my carry gun. A shield in 9mm wouldn't be bad though, especially for $250. I know a lot of people are hating on Springfield but I like their guns. I'd like to see/touch the new XDE in 9mm. My only hammer fired semi-auto is a P22. Fun to shoot but picky with ammo. I won't buy 5.56/.223 for more than 30c a round, got "plenty" now too. The fact i can get 5.56 for that price is great. 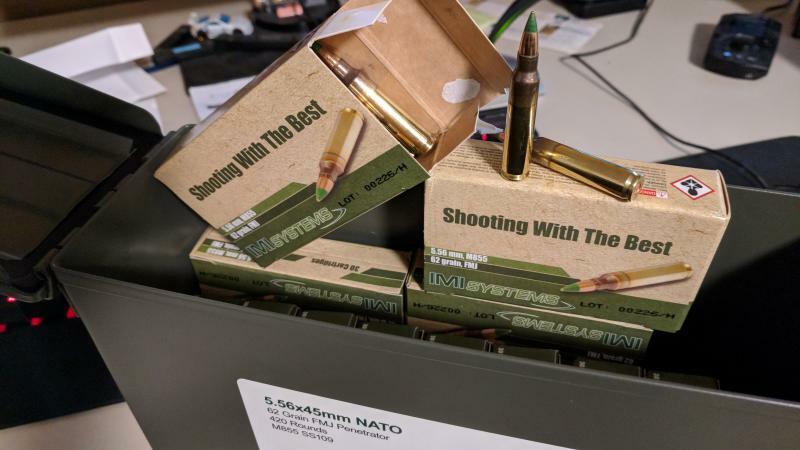 Kicked myself for missing out on a deal (went out of stock before i realised how good it was) 5.56, IMI again i think, for 24c a round shipped. Between all of the ammo in my safe, I have over 5k rounds. I'm not sure if I should have a placard on my house or not, haha. The XDS in .45 isn't too bad. Packs a punch though for sure. It's fired anything I've fed it. Including the cheap Federal Aluminum stuff. I threw a Powder River Precision trigger spring kit in mine, made the trigger a little easier on the finger. MaDMaXX wrote: Well, this just arrived, and honestly, one of the best quality .30 cans i've ever seen, really over the top. Inspect your chamber and throat area prior to firing and after to make sure there is not any issues there as well. I probably have 400 rounds through mine and I haven't had any issues. I'm not one for modding triggers or springs, but given the tang safety and the trigger safety I wasn't worried about it firing if I happened to drop it or something. 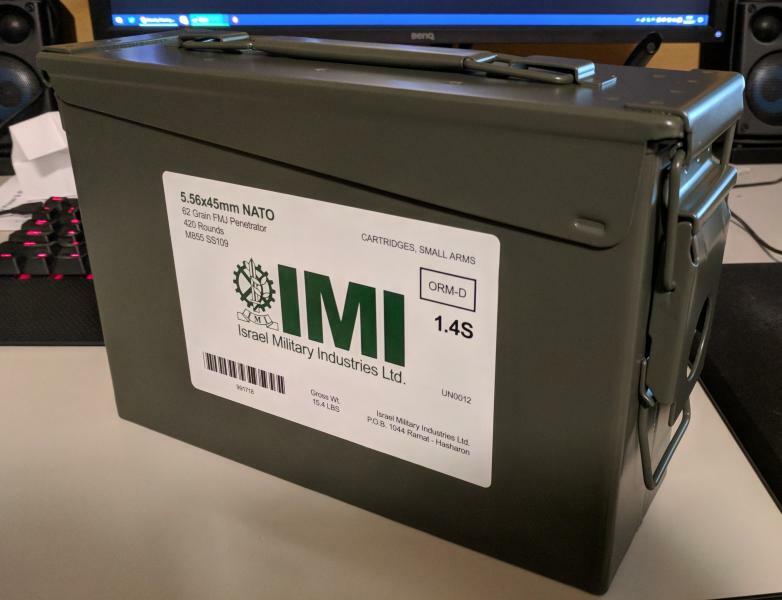 Also, good tip on that IMI ammo @Tsquare. I haven't heard that before. I reload most of my ammo. I also make friends at the range with people who do not reload and shoot the same calibers that I do. My buddy who had the IMI shot about 300 rounds of this and gave the spent brass to me. It was about a week before I took a look at it and almost all of it had blown primers to some degree. There were even some cases that heads show the fist stages of separation. I called my buddy and let him know about the condition of the brass. He had 3 more ammo boxes of it and sent it all back to PSA after having a conversation with them about it - it seems there are others that had issues with it as well. The bolt also took a beating with chipping on the face and lugs. Hmm, interesting on the IMI, I'll keep an eye out, they are sealed as well as crimped. Re the trigger, I was referring to legal issues, not safety. MaDMaXX wrote: Re the trigger, I was referring to legal issues, not safety. I would be in trouble. Most of my guns have some light polishing, different springs, or drop in replacements. Different states with different laws and mindsets. I have a Tanfoglio cowboy SA 22lr that came with just under 2 lb pull - it has the lightest trigger of anything I have ever shot and it also has zero creep in the trigger. My daily carry has a 4.7 lb pull. My target pistols all have about a 4 to 5.5 lb pull. My rifles have everything from 3.5 (AR-9) to a 6 lb pull on my 30-06 bolt. Not adverse to smoothing out the stuff i have either, the GP100 actually got heavier springs fitted as the SA pull was way too light after i polished and 'springed' it. And just so i'm not being ambiguous on the trigger stuff, i will clarify that i'm referring to if/when you use in self defence, the prosecution *could* bring it up and try and make trouble during the defence. 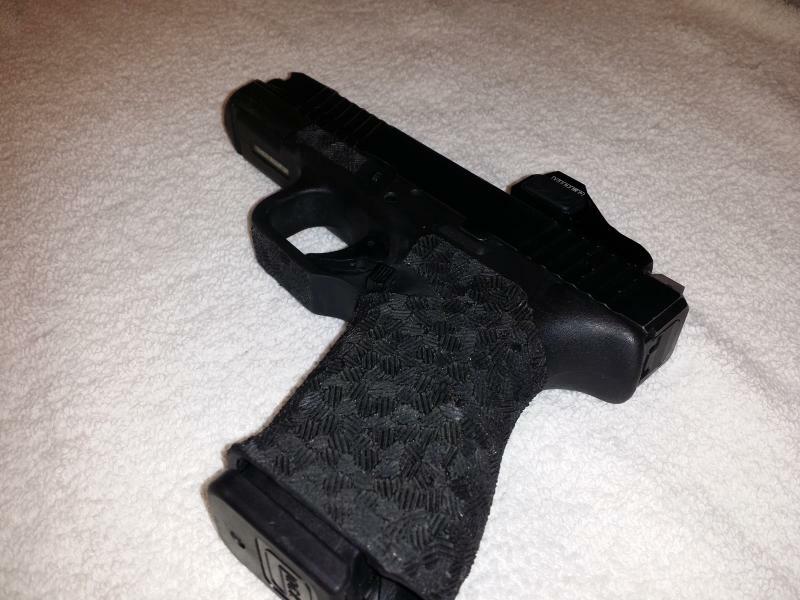 JAMMAN wrote: Do not get a LCP 380 they are cute and pack a punch for the one shot you get before they jump backwards. The only firearm I have ever owned (since I have been an adult) that I got rid of. The fact that the original LCP 380 is stated and always reviewed to have awful sighting measures for what should already tell you it wasn't meant to be used for aiming so much as a life saving tool to get someone off the top of you or away depending on the scenario being played out. The sights are there simply for effectiveness of IF you had to aim it at all. Which brings me to believe the long pull trigger also fits parallel into these thoughts. Where the LCP 380 shine is its size, low printing detection, and the fact it is chambered in 380 ACP. Its purely setup for last ditch efforts of defensive posturing whether in a personal or official capacities not defending your home with or picking off the local stop-N-rob liqueur store. For my woman, it works great as something she can carry at work where there is no specific policy's towards refraining of open or concealed carry but.... with today's media coverage people are apathetic and put off by the sight and therefore for the sake of keeping things "comfy & safe space" like, and does so with her concealed carry permit. Otherwise I am getting her used to my Glock 23 still chambered in .40 Cal until I get another slide and barrel to go back and forth to 9mm. Hence the reason why I am building a couple of them from 80% lowers/frames for multiple purposes... Two will be identical in every way. My lady likes guns 9mm and smaller. A .380 would be ideal for her. I hate .380 though, its expensive for what it is haha. For stopping power...well, I wouldn't want to be shot even with a .22. I'd have no problem carrying a .380. I don't own any Glocks but I've checking some out. I like the 19 just for fun and the 43 for a second carry gun. RiggerWings wrote: My lady likes guns 9mm and smaller. A .380 would be ideal for her. I hate .380 though, its expensive for what it is haha. For stopping power...well, I wouldn't want to be shot even with a .22. I'd have no problem carrying a .380. Totally! .380 ACP is ridiculous in cost! and I don't know, I been stabbed once and I think if I had to deal with it all over again, id rather be shot than stabbed again.. maybe im a fool in that thinking, dunno. As for the Glock. 19 and 23 use identical frames at least in the 3 pin 3rd Gens. The slides can mix and match between a single frame and for cost effectiveness use the 9mm for practice and be using the same firearm and then after play time was over, 2.5 mins or less I can swap the barrel, spring, and the slide and be back to .40cal as a 23 again. I like the .40 cal even though its a bit of a snappier round to me but thoughts also were that if SHTF and everything went wrong, most everyone around me, Metro included ALL have .40 cal 90% of the time so usable ammo "should" be prevalent if I had to pillage a fallen country (wo)man..
That's pretty handy to be able to swap calibers. I wonder if I can get a new barrel and spring for the XDS to use it in 9mil. I agree that there are much better distance weapons than an AR. I haven't ever used a 6.5 but I hear they're amazing. I'd love a good .338, though I don't think I could afford the ammo, not to mention the gun itself! Stormlake makes conversion barrels for the XDS. I have a range buddy that has converted his .40 to 9mm and uses that exclusively. He couldn't get any decent money for his .40 and wanted to get a 9 to shoot cheaper ammo. The conversion was a cheaper alternative. My primary AR rifle is a 6.8SPC. I got a aoudad sheep out in TX at just under 500 yards last year with it. Here in north GA it is unusual to get a shot more than 100 yards. I am shooting a 115gr Spitzer that has a very flat trajectory. It is currently over-scoped with a 8.5-25x50 Leupold that I pulled off my AR-10 when I sold it a few years back. I am shooting an AR-6.8 with a scope that is worth almost 4 times what I have in the rifle. The Leupold would be a good candidate for a .338 but it is too much trouble trying to find a 1000 yard or more range that is less than a 2 hour drive. I hit the range this morning. I am going through some of my less than stellar ammo I loaded up 5 years ago. This was when supplies were in short supply. I have good brass and projectiles but I loaded up 500 rounds of 45 pistol rounds using rifle primers. They work most of the time. About 9 % will light strike forcing me to stop and clear it. I never got into a rhythm and did not shot the 45 as well as I normally do. I have about 100 more of these and they will finally be gone. Sounds like you have a good arsenal and a good way to keep it up. I wanted to get into reloading, but no more than I shoot, it wouldn't be worth the cost. I used to shoot every other weekend, several hundred rounds at a time. Not so much anymore. I hate paying to sue a range. I shoot at the WMA range that is 35 miles up the road. It is $18 for a two year pass. When I was in the AF I joined the combat arms competition team. It meant a little extra PT but I got a few TDY's to advanced small arms schools/competitions and a quarterly allotment of ammo. I am surprised there is not a shooting group sponsored by MWR. I spent about an hour in my reloading room this morning. I pressed out 240 rounds of 45GAP and dropped another 300 or so cases in the tumbler to polish them up. Once they are polished I will press them out. Page processed in 0.2902 seconds (19% database + 81% PHP). 136 queries executed.